“The Legend of the Blue Sea” Filming Sites Uncovered! With top hallyu stars Lee Min-ho and Jeon Ji-hyeon as the main cast, the fantasy romance drama "The Legend of the Blue Sea" has been at the center of attention. Based on the love story of a mermaid in Korea's first written folktale series "Eowuyadam," "The Legend of the Blue Sea" follows the series of events of a mermaid, who can love someone only once in a lifetime, as she falls in love with a human being. The drama portrays how the past and present lives of Lee Min-ho (Dam-ryeong in the past, present name Jun-jae) and Jeon Ji-hyun (Se-hwa in the past, present name Sim-cheong) are intertwined with each other in a comical and lovable way. Continue on to discover the main filming sites where their love story unfolds! TIP) Know more, enjoy more! "The Legend of the Blue Sea"
In order to fully enjoy the drama, there are two things to keep in mind. First, mermaids in the drama have special powers to erase certain memories upon direct contact with human beings. Secondly, the mermaids of the past (gold mermaids) are different from the mermaids in the present (silver mermaids). Following the episodes so far, we can only speculate that the present lives and relationships of the characters are connected to their lives in the past. The story first takes place at a small shore village of the Joseon period, where mermaid Se-hwa is captured by humans after being caught in stormy waves. 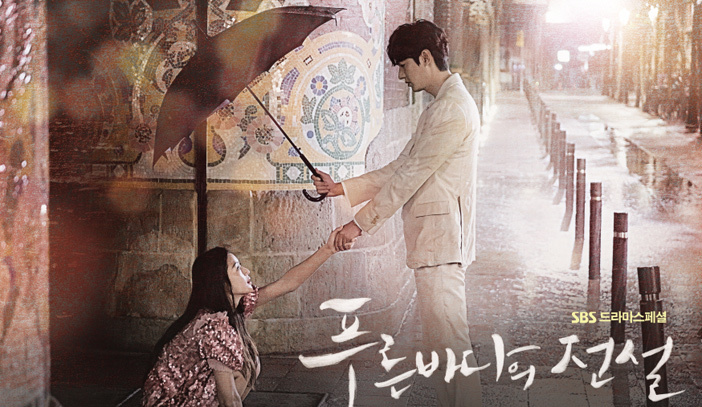 Dam-ryeong comes to the rescue, allowing Se-hwa to return back to the sea. Dam-ryeong and Se-hwa continue to see each other afterwards, with Se-hwa's story revealing that they had known each other since childhood. In the second episode, Se-hwa tells Dam-ryeong they will see each other again when wish lanterns float in the air. When the lanterns embroider the sky, their reunion takes place at a lake with emerald-like waters surrounded by marvelous, rugged cliffs. This scene was filmed at Cheonjuho Lake in Pocheon Art Valley. This lake was formed when stream and rain waters collected into a valley made from a granite quarry. Freshwater species such as salamanders and crawfish inhabit the waters of Cheonjuho Lake. ☞ Directions: From Cheongnyangni Station Transit Center Bus Stop, take Direct Bus No. 3200 to Pocheon-si Health Center Bus Stop → Cross the street and walk approx. 1 min. to Pocheon-si Health Center Bus Stop bound for the opposite direction → Take Bus No. 87-1 to Cheonjusa Temple Bus Stop → Walk approx. 5 min. 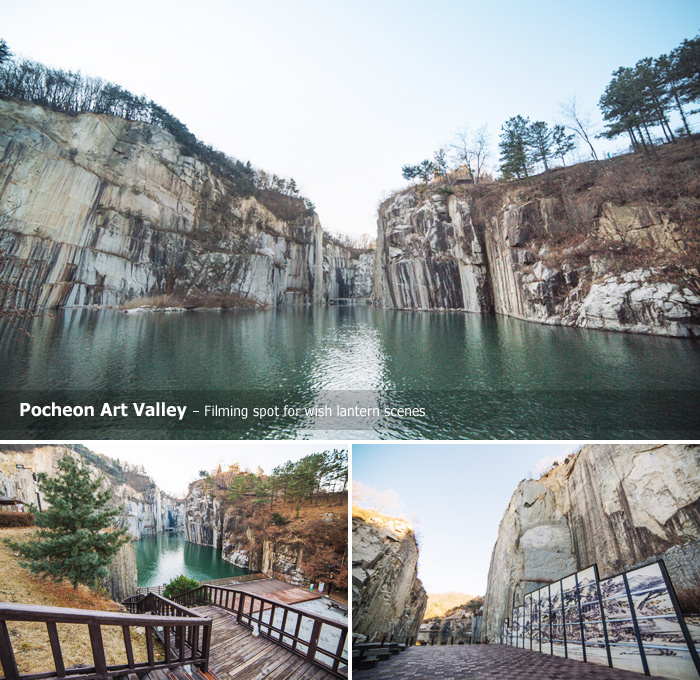 to Pocheon Art Valley. ※ Closes at 19:00 on Mondays. ※ Separate fees apply for monorail. 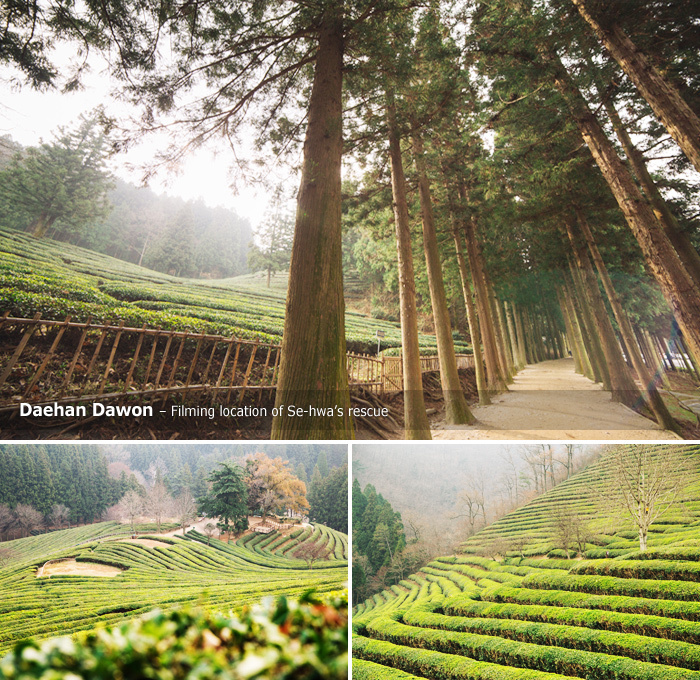 In episodes four and five, the action takes place in the past at Daehan Dawon (Boseong Green Tea Plantation). Se-hwa, who came on land to meet Dam-ryeong, is chased and eventually becomes surrounded by enemies with nowhere to escape. Dam-ryeong arrives just in time to save Se-hwa from danger. Afterwards, as they spend time together, Dam-ryeong makes a reference to the meaning of green tea flowers with words, "Something you have, but I don't," expressing his sorrow for having no memories of Se-hwa. ☞ Directions: From Boseong Intercity Bus Terminal, take Nongeochon Bus (Boseong-Gunhak) to Daehan Dawon Bus Stop → Walk approx. 6 min to Daehan Dawon. In the present, Jun-jae is a former MENSA member who is now a con-artist with hypnosis as his specialty. He was born into a wealthy household, but left home when his father remarried. Jun-jae misses his mother so much that his ultimate goal is to find her. He encounters various unexpected events upon meeting Sim-cheong. In episode one, Jun-jae and his friends are introduced to the audience with their whimsical and fraudulent acts. As they walk out of the building, an outstanding city nightscape passes by. This was filmed at a multi-complex culture and arts center known as Tri-Bowl. 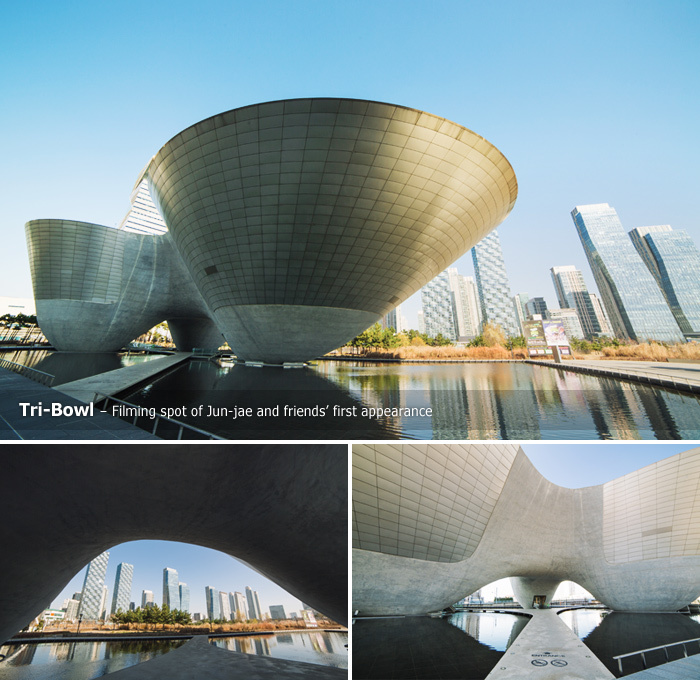 Its unique architecture of three bowl-shaped buildings floating on water symbolizes Incheon, a city in harmony with the sky, ocean, and earth. ☞ Directions: Central Park Station (Incheon Subway Line 1), Exit 4. Walk approx. 3 min. ※ As Tri-Bowl is a multi-complex center that facilitates exhibitions and performances, fees may vary according to available events. In the first episode when Jun-jae is away in Spain, Sim-cheong sneaks into his hotel room. Upon returning and finding his room a mess, Jun-jae reports Sim-cheong to the police but soon changes his mind and brings her back. In the next scene, the two are found at a shopping mall. 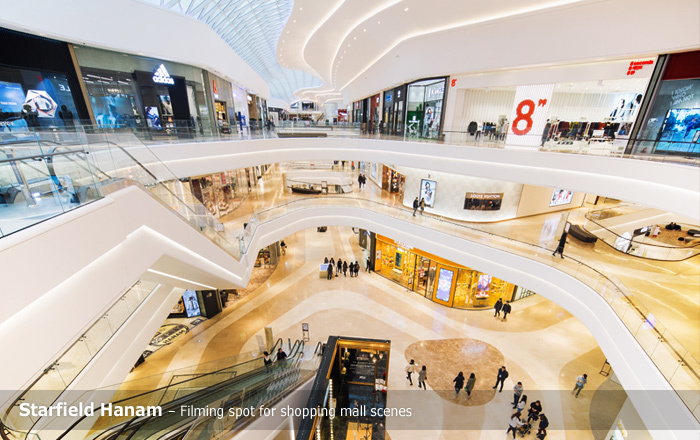 The shopping mall depicted in the dama makes it seem as if it is in a foreign country, but in reality, the scenes were taken at Starfield Hanam. As the largest shopping complex in Korea, it is regarded as one of the trendiest shopping malls in the nation. • Jamsil Station (Seoul Subway Line 2), Exit 7. Walk approx. 1 min. to Jamsil Bus Stop → Take Direct Bus No. 9302 to Starfield Hanam Bus Stop → Walk approx. 1 min. to Starfield Hanam. • Paldang Station (Seoul Subway Gyeongui-Jungang Line), Exit 1. Walk approx. 1 min. to Paldang Station Bus Stop. → Take Maeul Bus No. 50 to Starfield Hanam Bus Stop → Walk approx. 2 min. to Starfield Hanam. ※ Operating hours may vary within the mall. Where did Jun-jae and Sim-cheong's reunion take place? At Aqua Planet (Yeosu)! After Jun-jae comes back from his trip to Spain, he visits a special place that he frequents on his birthday. This special place is Aqua Planet, located within 63 Square. It is a place holding memories of his mother and where he reunites with Sim-cheong. 63 Square is mentioned several times in the drama, misleading the audience to assume that the filming was done at Aqua Planet 63. 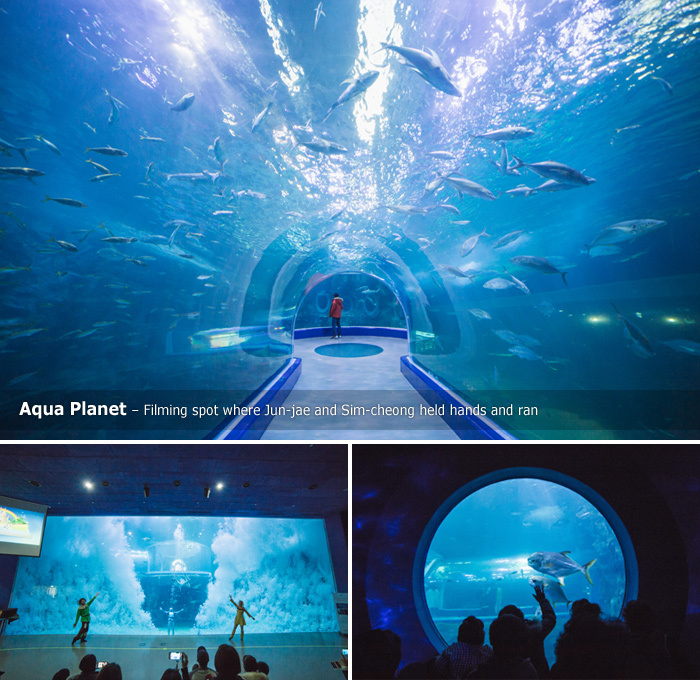 However, the actual filming location for both scenes was at the Aqua Planet in the city of Yeosu. The reunion scene was taken in front of Ocean Life’s main aquarium and the scene of the couple running while holding hands was taken in front of the 360-degree dome aquarium. ☞ Directions: From Yeosu-Expo Station, walk approx. 15 min. 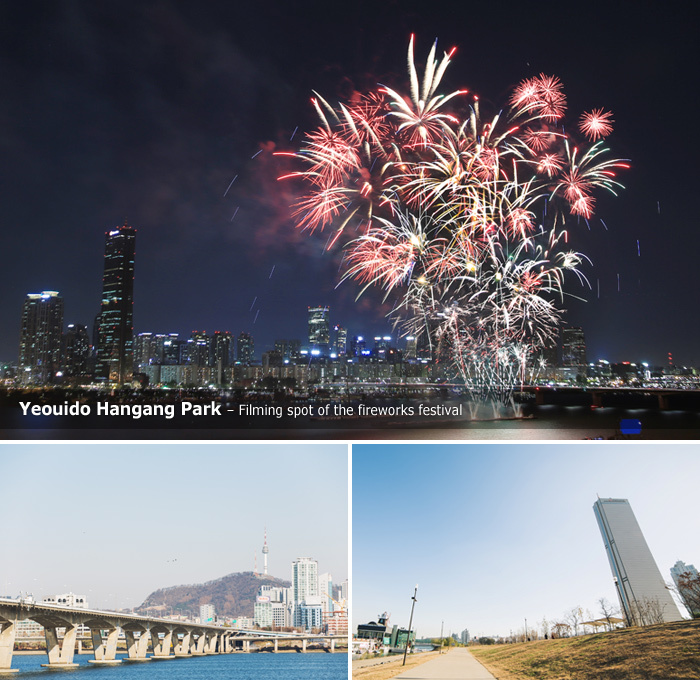 After Sim-cheong and Jun-jae reunite at 63 Square, they take a walk at Yeouido Hangang Park. Jun-jae questions Sim-cheong on how she recognized him, but fails to receive any answer. He leaves her, but runs into Sim-cheong again not long after. While they watch the fireworks show together, Jun-jae reminisces on his childhood memories of watching fireworks with his mother. ☞ Directions: Yeouinaru Station (Seoul Subway Line 5), Exit 3. Walk approx. 2min. Jun-jae's house probably makes the most appearances in the drama, along with N Seoul Tower in the distance. In episodes two through four, the audience can catch glimpses of N Seoul Tower in the background scenery. 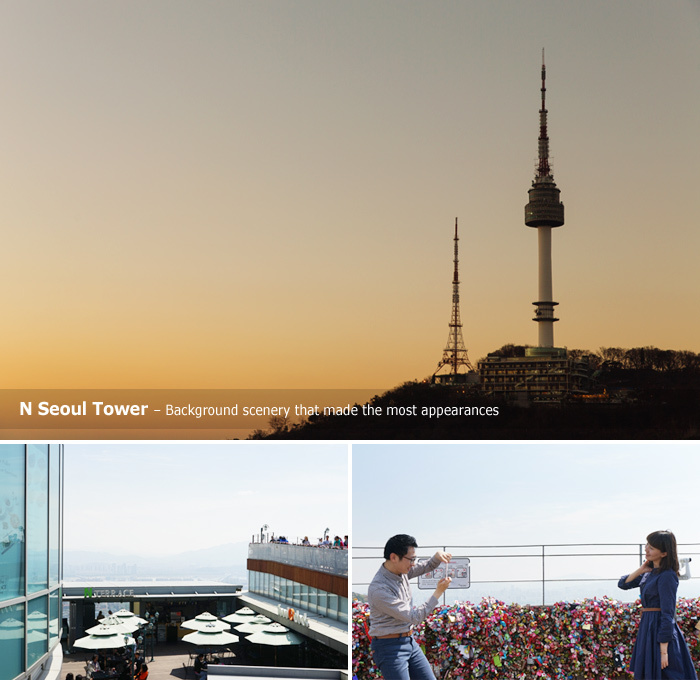 However, in episodes five and six, N Seoul Tower plays a significant role. It is the place where Jun-jae and Sim-cheong promise to see each other again on the day of the first snowfall. Jun-jae arrives at N Seoul Tower and waits for Sim-cheong, but unfortunately, Sim-cheong is unable to make it to the tower. ☞ Directions: Chungmuro Station (Seoul Subway Line 3, 4), Exit 2 → Take Namsan Circulation Bus No. 02 → Walk approx. 5 min. to N Seoul Tower. ※ Adult fee applies from ages 13 and over. Child fee applies to ages 3-12. Children under age 3 are admitted free of charge. * Intercity bus operates once a day at 15:10. * This column was last updated in December 2016, and therefore information may differ from what is presented here. We advise you to check details from the official websites before visiting.